If you have short to medium-long hair, you may find yourself considering clip hair extensions. The first thing to do is make sure you purchase natural, human hair extensions. Synthetic extensions are harder to style, while human hair can be styled just as if they were your own hair. Curling irons and straightening irons don't work on synthetic extensions. Clip hair extensions clip on below your natural hair. It is done in sections, so, you start by sectioning your hair. You'll make a ponytail on the top of your head, leaving about the bottom 2 inches free at the base of your skull. If you tip your head back, the point where it bends on your neck is the base. Clip the ponytail out of the way, leaving only the section hanging free. Take the first clip, and clip it onto the loose hair on one side of your head. Clip the next one to the other side, and finish by clipping the third extension in the middle. Now, you have a narrow strip of natural hair across the back of your skull, with 3 extensions clipped on. Now, take your ponytail down and part your hair again, across the back of your head, about 1 inch above the natural hair in the hair clips. This layer of natural hair will fall over the clips, partially hiding them. It will also give you a new section of hair for the clips. You can apply the clips just like you did the first layer, or use smaller sections of natural hair and add more extensions. You'll clip the side sections just above the ears. As before, re-section your ponytail. 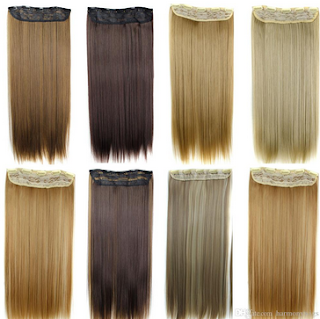 Once again, you'll have a narrow strip of natural hair covering the clip hair extensions you just added. 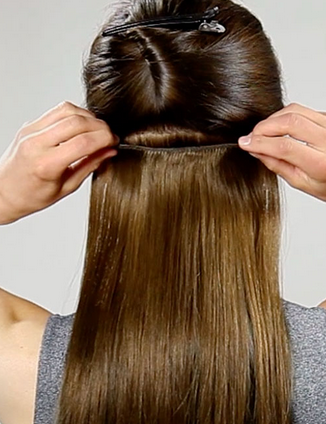 On this third layer, you begin using double-clip extensions. You'll need about 3 of the double-clip extensions to get around the back of the head. Re-section your ponytail again, just as you have done 3 times, again, leaving about a 1-inch strip of hair falling down over the double clips you just installed. The clips you attach now will be in random spacing. The main thing to remember is to not line them up exactly with the clips below them. You can use any number of clips here. Finish up by sectioning off the sides of your head. Take a small pinch of hair about 3 inches above your ear. Clip a small extension on that pinch of hair. Repeat this procedure on the other side of your head. Now that your Clip Hair Extension is in, style your hair as usual. Your hair will look better if you use a curling iron because it will help blend in your natural hair with the extensions. If you have curly hair, curling the extensions is vital. Or, you can straighten curly hair before adding the extensions. Finally, enjoy your full head of luscious hair. If someone asks if it's all your hair, say, "Yes!" After all, you bought those extensions, so they're yours!